Toschi Acrobatic Fruit will give a fantastic twist to all your drink creations. Toschi Fruit Purees are made with fruit flesh and juice, designed to give your cocktails and smooties the texture and flavour af fresh fruit, without the space they occupy. Toschi purees give you the freedom to mix your own creations in a handy 1.32 kg spouted bottle, that can be safly closed and stored away. 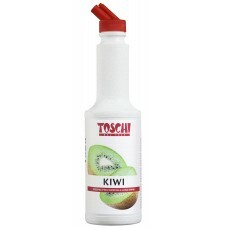 Why not try Toschi Kiwi Puree in your next Kiwi Papaya Smoothie?